2) Burkinis. What a fab invention! Allows me to stay modest whilst enjoying a dip in the swimming pool! Hooray! 3) Family. I always say Alhumdulillah for this one, but this month having my brother with us made every day spent together memorable. Also, when Mr Z and I fell ill, my sister and brother in law swooped right in to take care of Baby Z. I was definitely not in a state to be looking after a toddler when I couldn’t even stand up myself! 4) Go Pro Camera. I mean the lens on that is INCREDIBLE. Just being able to capture all those special moments on some sort of technical device that we can look back to is pretty amazing, isn’t it? 7) Curling up with a good book and a smoothie (okay, who am I kidding, it was a bag of Max crisps!) whilst my baby naps beside me. 8) Body Massages. Just WOW. I have said plenty on that already, here. 9) Meeting new people thanks to the world of blogging, and instantly enjoying their company! 10) Getting the taste just right when slaving for an hour after a family dinner. 11) Health. We take it for granted some time, but we are truly blessed to be able to move around and do what our bodies permit. Without our good health, we could achieve nothing. 12) Birth of my beautiful niece Baby A. I am once again awestruck by the miracle of birth. 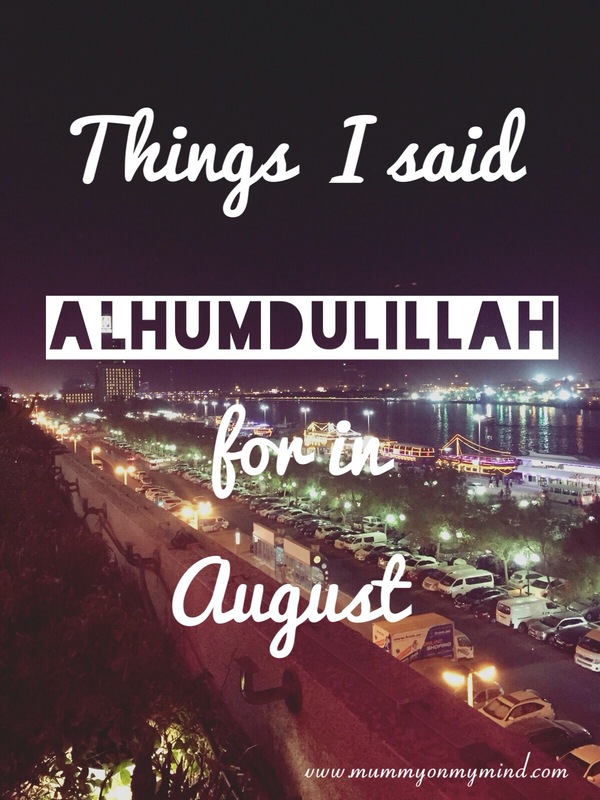 These are just twelve of the many times I uttered the words Alhumdulillah this month. Check out what I was thankful for last month here. What are you thankful for? Feel free to share your moments in the comments section below! I just love these sort of posts of yours 🙂 keep them coming every month. They are awesome. There are plenty I say الحمد لله for too. Yep, we do take health for granted sometimes (or most times?) but yeah that is one of the biggest blessings. Thanks you, that is very kind of you. It’s a lovely way to reflect upon all the blessings in life, big and small! I will surely keep them coming. ?